In My Double Life 1 Nicholas Hagger told of his four years’ service and double life as an undercover British intelligence agent during the Cold War (there revealed for the first time). Lost in a dark wood like Dante following his encounters with Gaddafi’s Libya and the African liberation movements, he found Reality on a ‘Mystic Way’ of loss, purgation and illumination, perceived the universe as a unity and had 16 experiences of the metaphysical Light. In My Double Life 2 he continues the story. He received new powers, coped with fresh ordeals, acquired three schools, renovated a historic house, and had 77 further experiences of the metaphysical Light. He founded a new philosophy of Universalism and new approaches to contemporary history, international statecraft and world literature. He produced nearly 1,500 poems, over 300 classical odes, five verse plays, two poetic epics, over a thousand short stories – and 40 books that include innovative literary, historical and philosophical works. 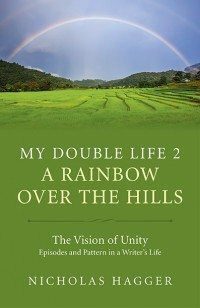 His vision of Universalism in seven disciplines is like a rainbow with seven bands overarching seven hills. Vividly and movingly written, My Double Life presents a successful quest in two parts and in social and metaphysical tiers. It connects Hagger’s works to his everyday life, the source of his inspiration and the causes of his time. It teems with lively portraits and reveals a many-sided writer. Hagger tells his story in episodes whose conflicting events reinforce his double life and show a universal pattern. However, his underlying single life is in harmony with the invisible, infinite Reality that orders the universe and reconciles opposites. Was his path freely chosen or a Providential opening of the way? A man of letters and poet, cultural historian, philosopher, educationalist and author surveys his life’s pattern and achievement in terms of this ultimate philosophical question.